The east, to me it is the Rayong and Pattaya area where you find a lot of easy accessible, good courses all over. After playing some over there I have decided to have base in or around Bangcha (I do prefer the St Andrews 2000 resort) and play in that area, St Andrews 2000, Green Valley, Eastern Star and Emerald. Pattaya gets a little crowded and the courses around Bangcha are all very well maintained. Another very good area if you really want to get into golf is the PGA-course Laem Chabang. Here you can get accomodation and good golf at the same place. The three 9-hole stretches is good enough to keep you on your toes for many rounds. But, of course, I will be happy to take you wherever you want to play. 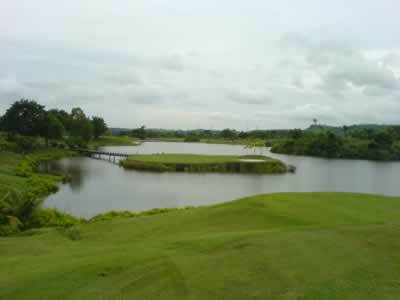 All on the courses you will find at www.thaigolfer.com. On the first day there will be a warm-up session with video and/or camera documentation. We also take time to talk individually about swinging and your swing in particular. On the following days we play the courses of your choice, each and every day with a driving range session, game planning hints on the course and an individual sum up of the day. Last day there will be video and/or camera documentation, an individual evaluation and group evaluation. After that we part as better and more insightful golfers. Mr Lob book and arrange courses, accommodation and transfers. On this he charges you net costs + 10% fee. Mr Lob himself costs 6 000Baht a day plus expenses (green and caddie fees, accommodation).